It is the mind killer for a large percentage of the workforce. There is a percentage of those employees who have the capacity to embrace change as opportunity for learning. There is a much larger percentage of those employees whose foreheads hit the desk as soon as a new process is announced … in other words, more change. It is not terribly challenging to engage the employees already aware of the bigger picture and looking for continuous improvement opportunities. These individuals should not be ignored or they will be lost to your competitor; however, the challenge I’m addressing today is creating a connection to all the employees whose foreheads hit the desk when they were informed of a new process adoption or new method to use. How can we disrupt their apathy … their preference to sit in neutral … their addiction to the status quo … and transition them to a sense of purpose? Distributing a report on metrics and how they are not sufficient only motivates the desire to achieve the numbers required. We put on performance reports the “5” of “going above and beyond”, explain how we don’t give those out, and then feel frustrated that the pieces of flair (click to get 2 minutes of really sad context) somehow turned into a metric instead of an icon of culture. Find the stories that address the WHY. Giving everybody the solution and how to apply it removes the curiosity. It removes the intrinsic motivation to experiment and discover. Giving everybody why we are trying to solve a particular problem though, and they become contributors. Their stories are not only providing more dimension, but they have been engaged. The metrics are merely facts to bore the believers and to occupy skeptics with hole poking. Sure, metrics are a part of measurement, but that is not the motivational aspect of measurement. It’s not the catalyst of transitioning apathy into purpose. It’s merely a checklist. It is through the discoveries found by individuals and the subsequent changes in behaviour where change starts to trigger. Why? Because the perception of reality has shifted. New values are being explored internally rather than being inflicted externally. How will you engage your team’s purpose? How will you create a value of experimenting and learning? 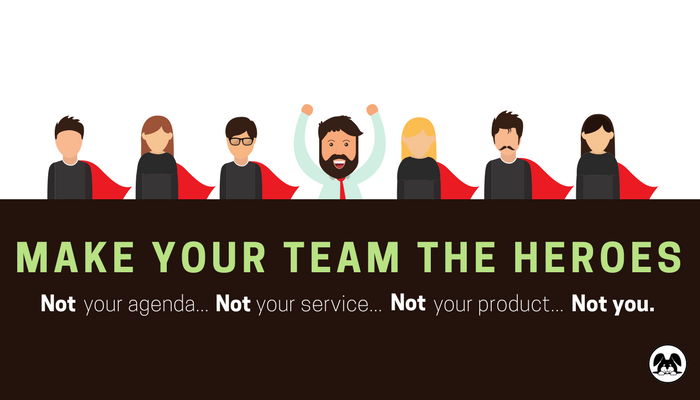 The approaches of finding resonance, seeking value over data, and making your team the heroes disrupts the complacency around the status quo and will help you develop learning habits together that shifts both you and your team to find learning as natural as breathing!